Bast was chosen by this blade to be it's wielder. It has become a new entity through the reforging process, and contains the knowledge of untold centuries. Stormbringer reveals little of itself, but it is clear that it has existed for some time and accumulated a sizable amount of knowledge. Whether or not it shares this knowledge is another story. It is currently suppressing the personalities of Ravager, Ripper, and Void’s Tear, keeping the corruption in check. 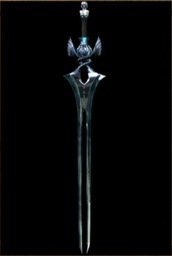 Containing the joint powers of Ripper, Ravager, Void’s Tear, Stormbringer and Mai’Kash, this weapon is among the greatest ever to be present within the world. Along the blade is a inscription in the long dead language of the Gladeborn, offering words of solace to the torn soul of the wielder. On the opposite side, it offers only promises of vengeance upon those responsible for the deaths of countless mortals. Stormbringer has become a different sentient than before, it exists as an embodiment of the truest virtues of honor, justice, and courage. It also seems willing to follow Bast’s lead, almost crying out for the blood of their shared enemies. It has many memories, and with the corruption gone, can access them all.